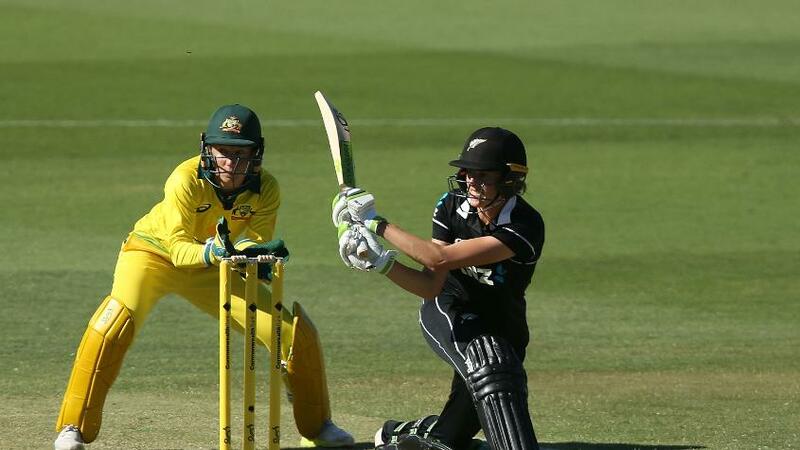 New Zealand captain Amy Satterthwaite compiled a measured 92 in a chase of 242, but Jess Jonassen's expertise with the ball cut New Zealand short as Australia won the first ICC Women's Championship ODI by five runs. New Zealand's bowlers did well to bowl Australia out for 241 in Perth on Friday, 22 February, despite Rachael Haynes's fifty. Satterthwaite and Katie Perkins then seemed to put New Zealand in control with a 99-run stand for the fourth wicket, but Jonassen triggered a collapse as the visitors slipped from 188/4 to 235/9. New Zealand's chase was off to a rickety start, with openers Sophie Devine and Suzie Bates falling cheaply. Devine, playing her 100th ODI, was done in by Ellyse Perry's extra bounce, as she cut one straight to point. Bates was pinned in front by Megan Schutt. Perry's dismissal of Lauren Down was a swing bowler's dream. She set her up with two big away-swingers before bowling an in-dipper to have her off-stump rattled. At 44/3, New Zealand's chances didn't look too bright, but captain Satterthwaite sunk her teeth in and stitched up a 45-run stand with Katey Martin until the latter was castled by Georgia Wareham for 20. Katie Perkins joined the captain and the duo batted sensibly to forge a crucial 99-run stand. Perkins was dismissed for 48 when she spooned a return catch to Jonassen. However, the asking rate at that point had just crept over six, and dot balls created pressure. Jonassen expertly cashed in by removing Amelia Kerr and Leigh Kasperek off successive deliveries in the 47th over to completely turn the tide Australia's way. The decisive blow came when she dismissed Satterthwaite in the penultimate over of the innings. Hayley Jensen and Lea Tahuhu threatened to steal the game back in the final over by smacking a boundary each, but Schutt held her nerve. Jonassen finished her 10-over spell with 4/43 and was the pick of the bowlers. Perry was the next best with 2/39 from her two overs, while Schutt took 2/63. Earlier, Haynes was the star performer for Australia with the bat even as the rest of the top order had a rare off-day. Opening the batting, she showed her intent in the second over when she powerfully flat-batted Rosemary Mair down the ground for a boundary. She continued to punish anything fractionally wide or short. Her innings only grew more intense as her partners were dismissed cheaply. She brought up her fifty off 61 balls with a nice paddle-sweep off Kerr. She was finally caught at mid-on by Satterthwaite, off Mair's bowling, when she miscued a heave over deep mid-wicket. With her dismissal, Australia slipped to 125/5, meaning she had scored well over half the team's total at that point. Tahuhu had done the early damage, removing Alyssa Healy for just four. Mair proved her worth on debut by getting rid of the dangerous Meg Lanning, Australia's captain, for just six. Perry was the next to fall, for six, when Devine had her caught behind. Kerr then snaffled Beth Mooney (13) and Elyse Villani (18). Things looked down for the hosts, but Ashleigh Gardner and Jonassen scored enterprising thirties to push Australia's total closer to 250, before they were bowled out in the final over, with Devine doing most of the damage in the late overs to finish with 3/32. Kerr, Jensen and Mair finished with two wickets apiece. New Zealand's bowlers created a great chance for their team, but the batters weren't quite up to the task.